Now that I’ve made my first pumpkin recipe of the season, candy corn was the next logical fall ingredient right? Candy corn- you either hate it or you love it. I’m actually not a big fan, but my family likes it. With temperatures still over 100 degrees here in Texas I’m trying to ease my way into fall baking, and what better way with a no bake treat. Cookie bark is super easy (and forgiving) so there’s no real “recipe” for it. Just estimate what you need based on the size of pan you plan to use. Start with enough crushed cookies and candy to cover the bottom of the pan and then cover with almond bark. I used equal parts of orange candy melts and white almond bark to make this candy corn cookie bark. This is a great recipe to make with kids. My daughter loves to help me crush the cookies- I place them inside a ziploc bag and let her go to town with a rolling pin. She’s also a big help measuring out ingredients or swirling the orange and white together. No bake recipes are perfect for getting kids started in the kitchen. 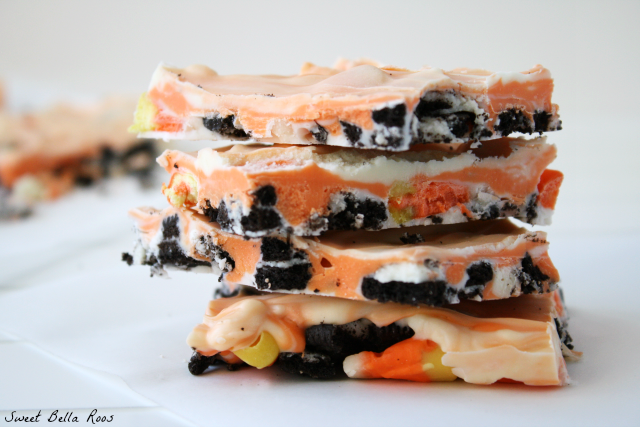 This candy corn cookie bark is a festive, no bake Fall treat.. This is a great recipe to make with the kids! Arrange the crushed cookies and candy corn into a single layer on a cookie sheet lined with parchment paper. Heat the almond bark/candy melts in the microwave at 30 second intervals (50% power) until melted. Pour on top of the cookie/candy mixture, use a spoon to swirl and smooth out to the desired thickness. Place in the refrigerator until the almond bark hardens. Remove and chop into pieces as desired. I prepared my batch in a half sheet pan- 12 cookies, 1/2 cup candy, 1 cup orange melts, 1 cup almond bark. Adjust the measurements to fit your pan. This looks awesome, and it’s so festive! Can’t wait to try it! I love this- perfect to bring to a Halloween party or give as gifts! Fun! I am having a Halloween party that this would be perfect for! Found you on Whats cooking Wednesdays blog hop! Made this for my daughter’s Halloween party today! I just used white chocolate and used food coloring gel to color it orange. I also used the Halloween Oreo so the orange inside of those made it look even more festive. It was very simple to make and very yummy to eat! I am not that into candy corn either, my sisters are. Love how beautiful it looks though, this bark and the oreos– gorgeous!! Do you heat bark and Wilton’s together in one container? Thanks! Hi Julie- no I give each color its own container to melt. HTH! 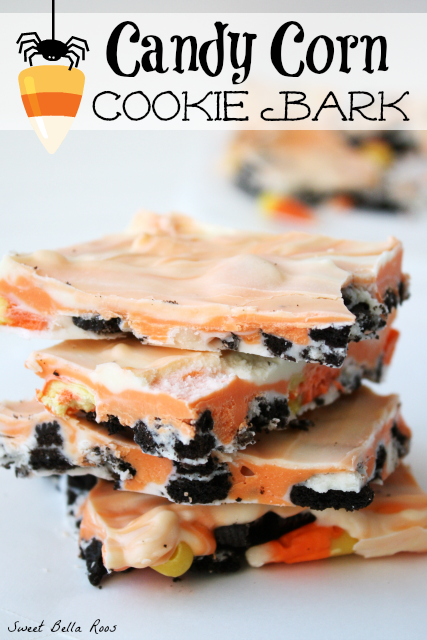 love candy corn bark and oreos make it that much better!! This is the cutest Halloween treat!! My boys would love it! What are orange candy melts?